The inspector general's report did not say whether Trump had violated the Constitution and did not recommend canceling the lease, but urged a legal review, which the GSA has promised. WASHINGTON (AP) — The General Services Administration improperly “ignored” the U.S. Constitution’s emoluments provision outlawing foreign gifts when it green-lit President Donald Trump’s management of his Washington, D.C., hotel after his 2016 election, the agency’s inspector general said Wednesday. The inspector general’s report did not say whether Trump had violated the Constitution and did not recommend canceling the lease, but urged a legal review, which the GSA has promised. “The agency agrees with the report’s single recommendation and will take action consistent with that recommendation,” GSA General Counsel Jack St. John wrote in response to the report. Trump won rights to lease the federal government’s Old Post Office site in 2012 and opened it as a luxury hotel in October 2016. Though Trump gave up day-to-day management of the Trump Organization when he entered the White House in 2017, he held onto his corporate ownership and earnings, including the Washington hotel. Almost immediately, the hotel just blocks from the White House became a magnet for lobbyists, interest groups and foreign officials looking to curry favor with the newly elected president. The Kuwaiti and Philippine embassies have thrown parties there, and a public relations firm working for Saudi Arabia spent nearly $270,000 on food and rooms. Rep. Elijah Cummings of Maryland, the new Democratic chairman of the House Oversight Committee, said the inspector general’s report was “devastating” and “proof” that Trump should have divested from his business before assuming office. 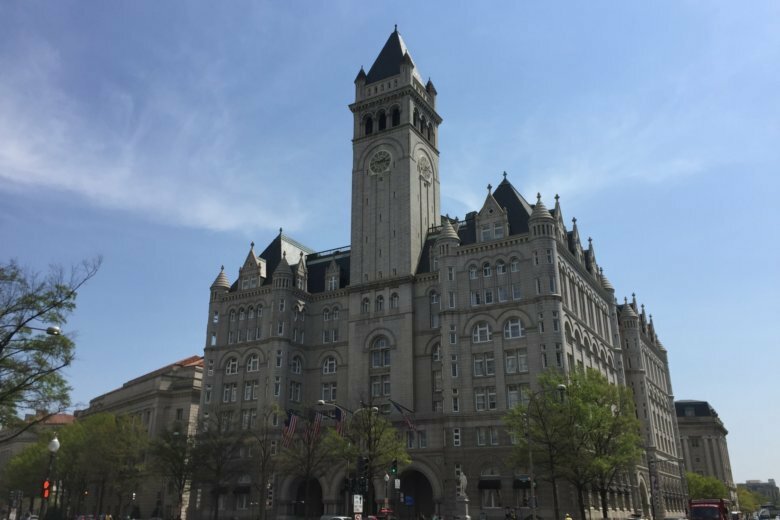 Trump is also being sued by attorney generals for Maryland and the District of Columbia who contend that the earnings Trump receives from the Washington hotel violate the emoluments provision. The case is now before a federal appeals court. Two other federal lawsuits also target Trump on the basis of the emoluments clause. Trump Organization officials did not respond to requests for comment from The Associated Press. The White House referred questions to a GSA spokeswoman, who did not go beyond St. John’s response. But the inspector general noted that soon after Trump’s inauguration in January 2017, GSA officials met with the president’s two adult sons, Don Jr. and Eric, and “strongly encouraged” that their father divest his ownership of the hotel. One of the officials told the investigators that he did not have leverage to force the president to divest and the issue remained unresolved. The next month, GSA asked the Trump Organization for its own analysis of the hotel lease, specifically a section that would prevent elected officials from being allowed to be a party to the terms of the lease. According to the inspector general, the Trump Organization argued that the section was not a problem because Trump had agreed to the lease before he was elected.